Money and politics. Scientists and citizen activists. Eelgrass, oysters, and a whole lot of mud. This is a story of life and death—and hope for the future—in the estuary waters of New Hampshire’s Great Bay. When the mysterious stranger, clad in a black trench coat, appeared on the doorstep of Nancy Sandberg’s farmhouse, she bit her tongue and listened. No, she told him, she wasn’t interested in selling. As soon as he was out of the driveway, Sandberg called her neighbors. Then she called a meeting. “We were all suspicious,” she says. “We decided we needed to try to figure things out. So we got organized, then and there.” The group appointed Sandberg as their chair and, just like that, the 27-year-old mother became a citizen activist. The midnight phone call came in September, shortly after the visit from the trench coat-wearing stranger. Phyllis Bennett, one of Sandberg’s neighbors, was still at work at the fledgling newspaper she’d launched just weeks earlier, and the voice on the line was urgent. He had a tip. Bennett assigned a reporter to investigate, and a few days later Publick Occurrences broke the story with a front-page headline: “Dark Shadow Over Durham.” Another story followed shortly: “Pipeline Coming to Durham?” The truth, it turns out, was more incredible than all the rumors: Aristotle Onassis was planning to build the world’s largest oil refinery on the shores of Great Bay. 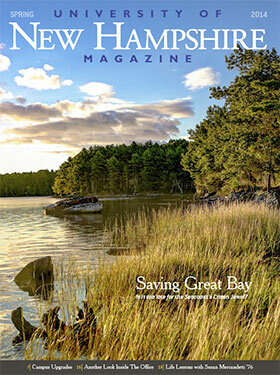 So began a David-and-Goliath battle for the future of New Hampshire’s Great Bay. One of the country’s most important inland estuary ecosystems, the bay includes more than 7,000 acres of open water and wetlands and is home to more than 23 threatened or endangered species. Fed by fresh water from seven rivers, the bay’s mudflats, saltmarshes, and eelgrass meadows are awash in a nutrient-rich mix that provides vital habitat and feeding ground for wildlife, as well as critical storm water control and an idyllic setting for boating and fishing. And yet the bay, which lies 15 miles inland from the ocean was—and still is—a mystery for many residents and visitors, who do little more than admire its shimmering beauty as they drive across the bridges that span its northern waters where it meets the Piscataqua River. “We realized that we’d better fight for this jewel, or we might lose it forever,” says Sharon Meeker ’75G, who had just moved to Durham in 1973 and wasn’t about to watch Onassis swoop in and destroy the very thing that had drawn her to the New Hampshire Seacoast in the first place. But the activists had their own ammunition—and Sandberg’s “brigade of housewives” to lead the charge. “Save Our Shores,” or SOS, became their battle cry—and the name of their group, which grew to several thousand members. They created handouts, wrote newsletters, and circulated a giant petition. “We taped it end-to-end, and it ran the length of Main Street,” recalls Meeker, who also helped coordinate and distribute papers by 14 UNH professors addressing a slew of economic and environmental issues surrounding the refinery. Publick Occurrences published every word of their findings, devoting entire editions to the battle and providing activists with the facts they needed to fight back. Jobs for all? Refineries require highly specialized labor, which meant most of the jobs would go to out-of-state experts, not to locals. Tax relief? Because an oil tank is considered “machinery,” which is not taxable in New Hampshire, most of the 3,500-acre refinery would remain tax-free. As for cheaper gas, research confirmed that prices near refineries in New Jersey and Texas were actually slightly higher than gas prices in New England. And lines at the pumps were longer. On March 3, 1974, the Olympic Oil Refinery team made a public presentation at the invitation of Durham’s selectmen. NBC’s “Today Show” was in town for the event, and a standing-room-only crowd was gathered at the UNH Field House. Students in flannel shirts and hiking boots faced off with Texas oil executives in suits. Questions flew. Claims were made. One of the oilmen, recalls Dudley, responded to concerns about the refinery with this reassurance: “It’ll be clean as a clinic, and at night, with all the lights on, it’ll be lit up pretty as a Christmas tree.” The crowd roared. In the end, “the most important thing that happened in Seacoast New Hampshire was what did not happen,” notes local historian J. Dennis Robinson ’73, recalling the 1974 defeat of the oil refinery on SeacoastNH.com. Thanks to a miracle of timing and events—a determined young legislator who wasn’t afraid to take on the governor, motivated citizens who threw everything into the fight, an upstart paper that helped to change history—nothing happened. But the Onassis chapter, as it turns out, was just the beginning of a much longer, more complicated, story—one whose ending has yet to be written. “I owe my career to Onassis,” says Peter Wellenberger ’74, who joined the student chapter of Save Our Shores when he was at UNH and has logged an awful lot of miles since, hiking the shores of Great Bay. 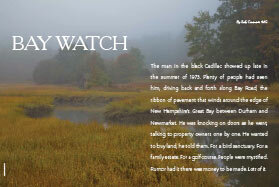 He’s seen great blue herons wing past overhead and watched the fog shift and settle over the tidal marshlands—and he’s spent more than 20 years helping to preserve some of the very land the shipping magnate had been eyeing for his oil tanks. “The refinery scared people,” says Wellenberger. “The bay had been spared this time, but it was still vulnerable.” Concerned about what could be done to protect the bay in the future, former SOS members formed the Great Bay Estuarine System Conservation Trust, and in 1989, the Great Bay was accepted into a network of 28 protected coastal areas of national significance. The dedication took place on the property of UNH physical education professor Evelyn Browne ’62G (the site today of the university’s Browne Center) and was attended by many who had fought the refinery—including Wellenberger, who was appointed director of the new reserve in 1990. With thousands of acres around the bay in private ownership—and ripe for development—Wellenberger and others took action, forming the Great Bay Resource Protection Partnership, a coalition of conservation organizations focused on land protection. In 1996, the partnership went to Washington in search of funding—and came back with $20 million for the next four years. Thanks to New Hampshire’s Senator Judd Gregg, the money kept coming—$5 million each year for 12 years. Asked one time by a reporter about whether all that money was an example of pork, Gregg, standing on the shore of the bay, famously quipped: “No, this isn’t pork.This is filet mignon steak.” By the time Wellenberger retired in 2012, the partnership had protected 107 properties totaling just over 6,000 acres. But even as the partnership went to work, another “dark cloud” was gathering. As more people discovered the beauty of the Seacoast—and decided to stay—development skyrocketed. Between 1990 and 2010, the region’s population grew 20 percent—faster than anywhere else in the state. Paved areas, rooftops, and other “impervious surfaces” shot up 120 percent, sending rain water straight into the bay without seeping into the earth for “filtering” en route. Meanwhile, the water quality in Great Bay was plummeting. By 2009, the EPA declared the Great Bay officially “impaired,” citing nitrogen overload and issuing tougher standards for the 18 New Hampshire wastewater treatment plants that discharge directly into the estuary. On an August morning shimmering with late-summer heat, Fred Short, research professor of natural resources and marine science, leans over the gunwales of his skiff, strands of emerald eelgrass draped across his open palm. “Here, look at this,” he says. “The blades are too thin.” He runs his long-handled hook through the water, stirring up a swirl of sediment. The eelgrass here grows in sparse clumps along the bottom, sometimes hard to spot in the murky stew of loose sediment. “This was a lush bed last year,” he says, hooking another piece of vegetation. This time, it’s a dripping chunk of sea lettuce, an invasive seaweed that thrives on nitrogen, hogging the light from above and eventually suffocating the delicate eelgrass. Short has been keeping an eye on the bay for 30 years—and what he sees has him worried. Not only is the total area of eelgrass coverage shrinking, but density within the beds has also decreased dramatically. He steers the boat to a healthy bed, and it’s easy to see the difference. Here, the water shimmers clear and green, the sediment anchored by thick mounds of emerald eelgrass waving just below the surface. These days, he doesn’t see beds like this one very often. Many are at 40 or 50 percent of their original density. In adjacent Little Bay, the eelgrass has vanished. It’s also disappeared along some stretches of heavily developed shoreline in Great Bay. Zostera marina, commonly known as marine eelgrass, has been putting down roots for thousands of years, but until recently, most people had never heard of it. Today this underwater flowering plant, often called an “ecosystem engineer” for its ability to stabilize the seabed and slow currents, has become the unlikely focus in a new battle for the bay. The enemy this time is nitrogen, hidden in wastewater treatment plants and septic tanks, parking lots and lawns, rain and snow and the air we breathe. There are other threats, too—phosphorous, chlorophyll, hydrocarbons, sediments—all of it accumulating over time and, if left untreated, slowly smothering the life out of the bay. And so the EPA recently stepped in with a new rule: 3 milligrams per liter is the new maximum acceptable concentration of nitrogen in water discharged from treatment plants. It’s a number with daunting implications for communities throughout the Seacoast, which collectively dump 20 million gallons of wastewater into Great Bay each day—none of it treated for nitrogen. In fact, the wastewater discharge from some of the towns has been measured at up to 10 times the EPA’s acceptable level. For some communities, achieving compliance could require hugely expensive updates for outdated treatment plants, leading to the doubling or tripling of resident sewer fees. And there’s another issue. Wastewater treatment plants are only one source of the problem. Of the 1,200 tons of nitrogen that makes its way into the bay each year, as much as 70 percent comes from so-called nonpoint sources—runoff from roadways, parking lots, farm land, and lawns, as well as groundwater that picks up the outflow from countless septic tanks. “While everyone agrees that we need to care for the bay, opinions differ on what that means and where the source of the problem lies,” says Rachel Rouillard, director of the Piscataqua Region Estuaries Partnership, a UNH-based, EPA-funded collaborative program that works to protect the health of the bay. Those in favor of accepting the new limits argue that working on wastewater nitrogen is the fastest route forward—an identifiable source that can be targeted and fixed. They also point out that more than half the nitrogen overload in the bay comes from human waste, much of it from sewage treatment plants. But communities battling the EPA say it’s unfair to focus on treatment plants when so much of the problem is caused by nonpoint sources, and some insist that the science is inconclusive. Indicator species like eelgrass, they say, are affected by weather, disease, and natural cycles, making definitive conclusions difficult. As Short wraps up his 2013 eelgrass survey, he pauses and looks across the water, his arm sweeping toward the horizon. The scene speaks for itself. The tide is going out, slowly exposing an expanse of eelgrass growing along the edge of a vast mudflat. Along the line of receding water, a gathering of herons, egrets, and other wading birds stand poised, waiting, a cluster of spindly legs and beaks silhouetted against the morning sky. The rolling water carries all the tiny fish and other invertebrates that depend on eelgrass for survival, serving them up to the winged customers, who snap their beaks and haul up breakfast as it rushes past. “It’s the ultimate bird buffet,” says Short, who worries that time is running out. Eelgrass is resilient, he notes, recounting success stories where nitrogen cleanup has sparked a return of aquatic vegetation. But if we wait too long, he warns, the buffet may close for good. On a breezy summer afternoon, Sable and Logan have their noses to the ground, sniffing. The two dogs are hard at work in the town of Durham, on the hunt for stinky sewage from leaky pipes, bad plumbing joints, seeping septic systems–anywhere untreated wastewater is escaping. When he picks up a telltale scent, Sable, a German shepherd mix, announces his discovery with a bark; Logan, a collie, promptly sits. These doggie detectives from Environmental Canine Services in Michigan are saving money for towns tracking contaminated water. Unlike standard laboratory testing, which can exceed $100,000 and take many weeks, this eight-legged team costs only $5,000-$10,000 for a week of work—and can provide immediate results. It wasn’t always this way. Historically, gravity and dilution took care of most pollution. Rain fell to earth, and contaminants were taken up by vegetation or “cleaned” as water seeped through the ground and then further diluted in the giant wash of water flowing into the ocean. Today, though, more and more communities are reaching 10 percent impervious surface area—the point at which water quality begins to degrade. In big cities, impervious surface areas can be as high as 90 percent. The earth can’t keep up. Which is why Houle gets so excited about a particular plot of pavement at a shopping complex in Greenland, N.H.
A mere five percent of the sprawling parking lot in front of Target and Lowe’s, the small section of porous pavement has been so successful at cleaning runoff that the water flowing back into Pickering Brook—and eventually into the bay—is cleaner than the water in the brook itself. “What we did was try to mimic the hydrology of the forest,” says Houle. “Underneath the porous pavement we built a giant storage area full of gravel—essentially a reservoir.” Water from the rest of the parking lot is directed into this underground area, where naturally occurring, beneficial bacteria go to work. “Basically, we slow down the water,” says Houle, “and return it to the brook clean. And then there’s the oyster, an unlikely superhero, recently enlisted to help save the bay. Because a single oyster filters up to 40 gallons of water a day simply by dining on plankton, oyster reefs create massive natural filtration systems. “They function like kidneys for the bay,” says Ray Grizzle, research professor of zoology at UNH. Not so long ago, the Great Bay estuary was loaded with oysters—more than 1,000 acres of them. Today, there are barely 100 acres left, the population decimated by disease, pollution, and over harvesting. But Grizzle and Ray Konisky ’03G, marine conservation ecologist for The Nature Conservancy’s Oyster Conservationist Program, are on a mission to restore the humble mollusk—as are some 58 local “oyster sitters” who have volunteered to help reestablish the population. Restoring oyster beds is painstaking work. It starts with clamshells—100 tons of them—trucked in from a Rhode Island seafood processor, cleaned and dried, and then loaded onto a barge. Next, a 150-horsepower pump rigged to a power hose blasts shell across the water in 50-foot swaths, covering the muddy bottom, creating a starter home for baby oysters, which need a solid surface to cling to as they grow. The idea is that, with a head start, the mollusks will rebuild a reef, creating a giant natural water-filtering machine. It’s slow going, though. It’s taken five years to build just 15 acres. The citizen oyster program provides just a fraction of the oysters for the restored reefs, but the program is growing and has been such a success that each season concludes with an awards ceremony. The good-natured competition can be fierce, with awards for Best Survival Rate, Greatest Number of Oysters in One Cage, Cleanest Oysters Ever, and, of course, Biggest Oyster. On the menu for the 2013 ceremony were Cedar Point oysters grown by Steve Weglarz ’83, one of about 10 oyster farmers who have recently set up shop in Great Bay—and become part of the restoration team. High-density farms, explains Konisky, where thousands of mollusks grow suspended in a relatively small space, could become an important supplement to reef rebuilding efforts. A few weeks after the awards ceremony, on a raw November afternoon, Weglarz and his four kids are standing at the edge of the bay hauling oyster gear from the water. It’s the last task of the season before winter settles in. To the west, just below the spot on the opposite shore where the sun is slipping from view, 200,000 oysters stacked in two dozen 4-foot high “condos” float in the icy brine, ready to wait out the winter in hibernation. Weglarz’s three boys, Dylan, Jake, and Liam, untangle ropes and buoys, pulling bits of sea lettuce from the empty condos, then strap the gear to the trailer. Back home, they’ll repair and rig the equipment for spring, when the boat will go back in the water, and it’ll be time to start working the farm again. Little sister Mia grabs a mesh bag, empty of oysters and in need of cleaning. “I feel some real responsibility to take care of this planet,” says Weglarz, who hopes that his oyster farm will play a small part in the ongoing effort to “save our shores” and that he himself will be part of another group of determined citizens banding together to change history. If we do it right, he hopes, his own children will find a better bay waiting for them when they grow up.